I was expecting anything because I don't follow the Southern hemisphere weather. I was just saying that if that was here I wouldn't be gettig excited over that. Do you find the 165km/h winds recorded on Victoria's south coast this week impressive? I do, because it was not from a hurricane, a direct hit from a deep low, or anything exotic. It was just a passing cold front. And at 39* latitude, it is not exactly in the antarctic storm abyss. Some more high winds forecast this week. Tomorrow is expected be wild, infact now at midnight winds are already strong. Wednesday will be the day for stupendous winds in Bass strait with a 966hPa low just south of Tasmania and a cold front moving through. Today was supposed to reach 26C. As of 11am, it is ****ing overcast with showers and just struggled to 20C. Been fairly cool lately. But the good news is that now we've entered daylight saving so I can now have an hour in the sun after work. While the temp failed to reach the forecast high miserably, (max 23.7C at 4pm), it is currently 23C at 11pm. So nice. Except it's extremely windy. And when I say extremely windy, I do mean ****ing windy as hell. Some brutal gusts as I type this now. 117km/h gust at Essendon Airport 7 minutes ago. Last edited by Full Overcast; 09-30-2013 at 08:27 AM.. The next day to watch is Wednesday. 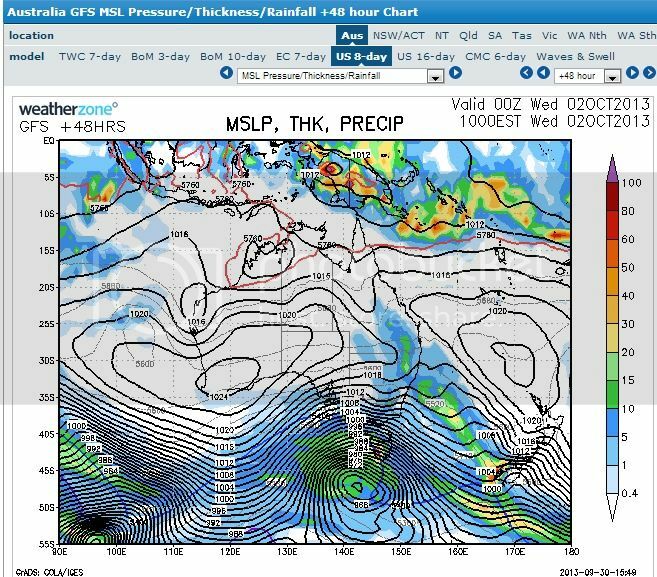 A 960hPa low is forecast to be positioned just south of Tasmania which will cause some serious **** on the exposed coasts of Victoria and Tasmania. Last edited by Full Overcast; 09-30-2013 at 10:44 AM..
typical cold stratus laden muck here. It was a f***ing difference between the first and the last two weeks, we simply had summer for one week and then winter came back to say a last goodbye. Subtropical things, we only can accept.